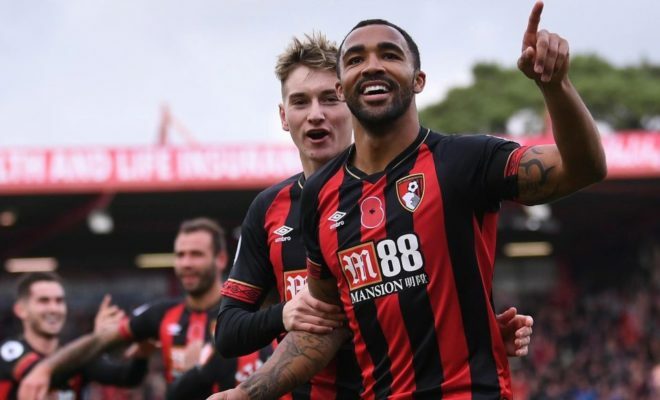 Chelsea have been backed to make a move for Bournemouth Striker Callum Wilson. The Blues suffered a shock 2-1 defeat to Wolves on Wednesday which leaves them 10 points behind leaders Manchester City in the title race. Chelsea continued malaise upfront is well documented with Alvaro Morata and Olivier Giroud failing to convince in the number 9 position which has hurt the attack. Wilson has emerged as a shock transfer target for the Blues and according to Bookmaker Betway representative Alan Alger, the striker’s odds of moving to London has been slashed. The England international has been in sensational form this season netting 9 times in 17 appearances in all competition. His good form earned him a call-up to the England national team, and he scored on his debut against the USA. Physical imposing, quick and deadly in the box Wilson could prove to be the perfect striker for the Blues. It would be interesting to see how he fares if he makes a move to a bigger side as we have seen many players struggle due to the pressure and expectation. However, Wilson would be a cheaper option and would need little time to settle in than an expensive purchase from abroad. Meanwhile, Chelsea will play a Premier League game against Manchester City on Saturday in what would be a big test for Maurizio Sarri’s side.